This is the first in a series of videos using the month's photos. I've really enjoyed the project so far, and only dread the day when I forget to take a photo! Finally managed to meet up with Esther today, for the first time this year. We had a walk on Port Meadow, during which I took this photo at 16.06. Also saw Up In The Air today, which was ok but predictable, and then did the quiz at the Gardeners' for the first time in ages. We won! It was a beautiful day in Cheltenham today. We visited an amazing second hand book shop, Moss, then wandered through this park, admiring its excellent Holst statue (photo: 13.04), before a delicious lunch at a gourmet sandwich restaurant. The Cotswolds looked lovely from the bus back to Oxford. More photos from the last few days are now on Facebook. Leen and I went to Cheltenham tonight to visit Rachel and Fraser, and this photo was taken at 23.11 in the Wheatsheaf in Leckhampton, where we'd seen Jinxed and Arson Fire. 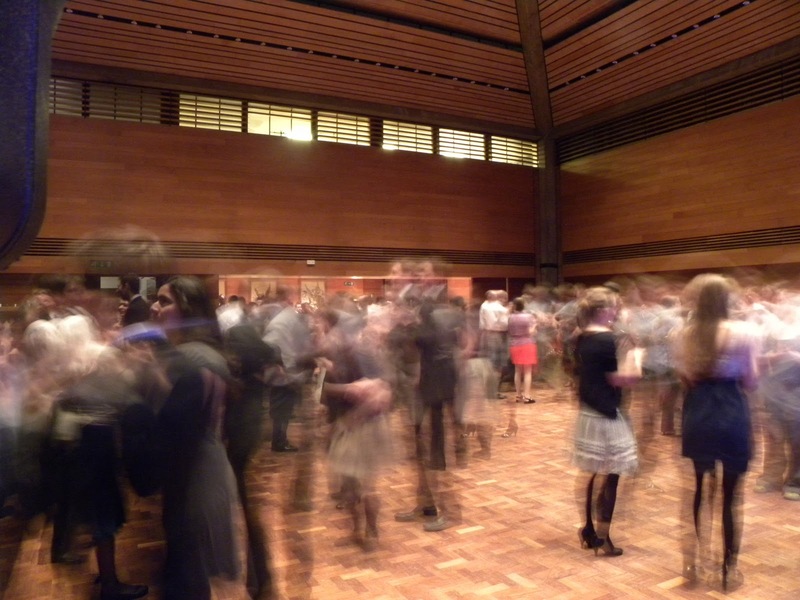 Fantastic fun tonight, first at Stephen and Matt's house for haggis and cranachan, then on to Wolfson college for their Burns Night (ish) ceilidh. Photo taken with the camera balanced on the band's speaker, at 22.52. A few more good photos from tonight will appear on Facebook, but probably not until Sunday. Scott from iFactory was in town today, so some of us went to the Bookbinders after work. Photo taken at 18.18. It's troubling Tuesday again, I'm afraid. Joined Rich in the college bar before choir, and the Lunns plus son Lunn were also there, which was fun. Took this photo at 19.18, as I left for my rehearsal. Today's Burns Night. We decided to watch a DVD, and I thought it should be something Scottish. I've seen Local Hero recently, and suggested Shallow Grave, which I'd never seen. Turns out it's really quite nasty! Not very Matthew-friendly. I did manage to laugh through the nastiest bits, though. So this is a photo of Christopher Eccleston being scary in Shallow Grave, taken at 22.05. Had lunch in Shepherd's Bush with these lovely people today. I hope the boys in particular are proud of their poses in this photo, taken at 12.57. Then a rehearsal in Barnes for the upcoming Betsy gig. What a brilliant day. Leen and I went to London Zoo, then met Lydia and Craig in a pub in Camden. Then to the Bleeding Heart for Carrie's birthday party, which involved fantastic food and wine, and less fantastic dancing. Today's photo was a tough choice, but obviously this meerkat's pretty special. Taken at 14.13. More photos from today are on Facebook. Saw Laura Veirs in concert at the Zodiac tonight with Evan and Tenelle. Jon O, Andy F, and Gerard were there too. A great gig, with lots of songs from her new album, July Flame. Photo taken after the gig, at 22.53, just after Laura had signed a song book for me. Taken by a stranger at the next table at 22.20. 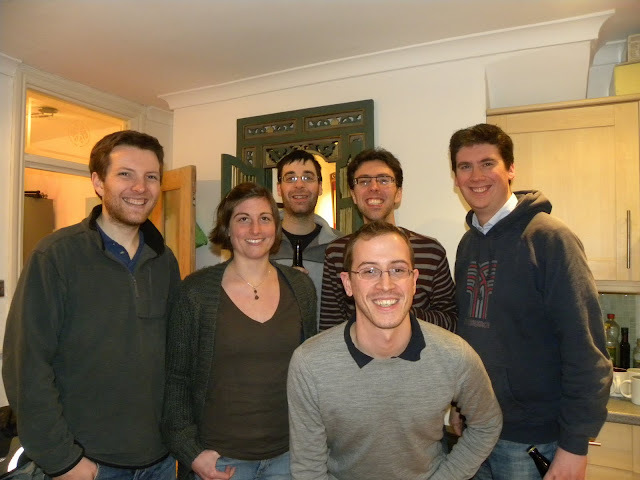 We had fun in the Cape of Good Hope tonight, marking Gareth's first Oxford visit of 2010. This evening I went round to Leen's for dinner. My tasty chocolate dessert was served on this brilliant plate. This picture was taken at 20.36, when there was just the right amount of chocolate tart left to serve as a nose. This is a good week for me so far, so the smiley face seems appropriate. Didn't take any photos until after choir today, so this was taken in Radcliffe Square at 21.41 on my way home. Starting to think Tuesdays may be the most challenging day for me on this project. This evening, after spin, I went for a pint in the Harcourt with Rich, Brian and Jo. Also posing here, perhaps strangely, is John, the landlord. Rich took the photo, at 21.43. We also had some very tasty cake which Jo made. The church of St Mary and St John, Cowley Road, taken at 15.28 on my way to the UPP to see An Education, which I enjoyed. Cooked chicken pie for Leen and Claire tonight, but forgot to take a photo of it. Tonight was Leen's birthday party at her house. Met lots of lovely people, including Dan, who can be seen here preparing with Leen's assistance a lethal but excellent cocktail called "My Head". Photo taken at 22.08. Three more photos from the party on Facebook. Food and a couple of pints in the Kite this evening with Rich. Still a cheap and great pub. We played darts, Rich winning 3 legs to 2, though I'm not sure either of us were very proud of our performances. Photo taken after we'd finished (so you can see our scores on the scoreboard if you look carefully), at 20.30. Leen got back from Belgium today. To mark her return, and her birthday yesterday, we went for an excellent meal at Chiang Mai. A really lovely evening. Some fresh snow overnight last night, so more travel chaos today. I'm still pretty much enjoying it though - it's so pretty, and so rare, that I don't want to complain. Yet. No news today, and nothing much to speak of, so here's a pretty picture taken in the quad at work at 16.06. First Jubilate rehearsal of term today, and we took on Britten's Hymn to St Cecilia and Vaughan Williams' Mass in G Minor. Photo taken during our break, at 20.38. Sorry, pretty rubbish picture today, because I didn't really do much other than come back from London and do some work! 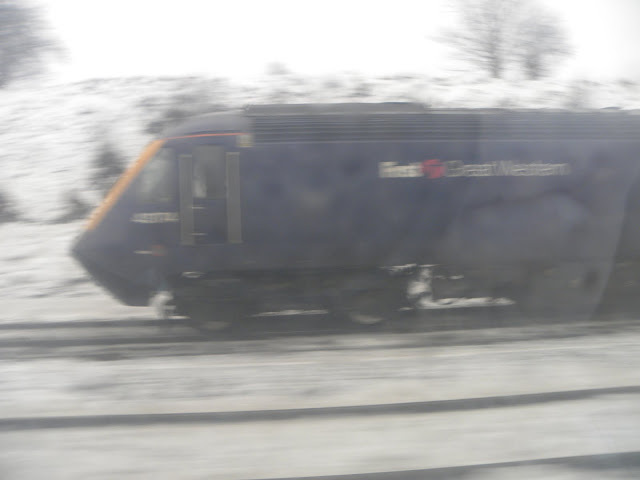 Taken from the train near Didcot at 15.20. I was in London today for a Betsy rehearsal. Naomi and Pete hosted, as we started to learn some of the music for our concert next month. We had a beer and a game of Where is Moldova once we'd finished practising, and took this photo then at 15.34. Got to love Jo's grin in this. Today's other candidate photos were a record of lunch with Martha at the newly-Thai Raddy Arms, and poker at Stephen's. 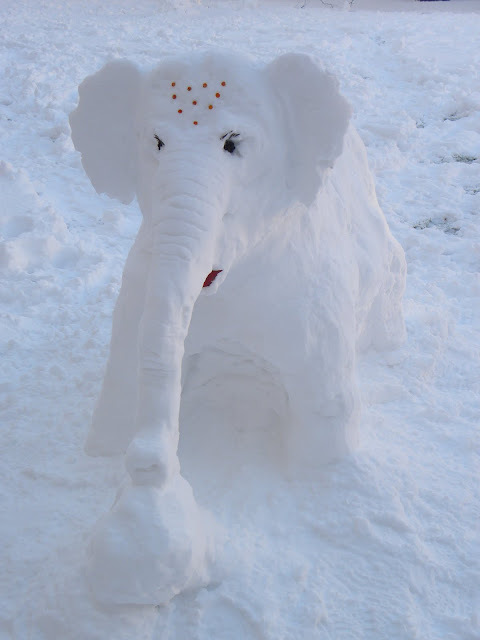 This fabulous snow elephant created by James and Kate in the quad at work had to be the winner, though. Taken at 09.56. I took this at 10.00, on my way to work. 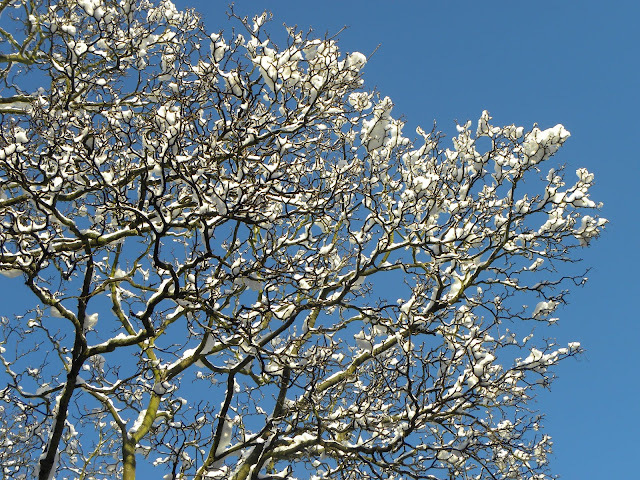 There was no fresh snow today, but it was beautifully sunny. Spoilt for choice again today as to which photo to use. I'm sure that won't last. There was more snow in Oxford today than I've ever known. 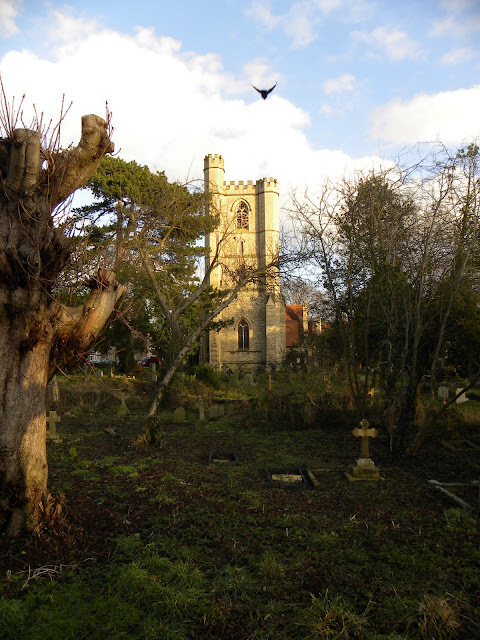 I went out at lunchtime and took quite a few photos around Jericho, and particularly in St Sepulchre's cemetery off Walton Street. I took this at 13.11. A few more are on Flickr. 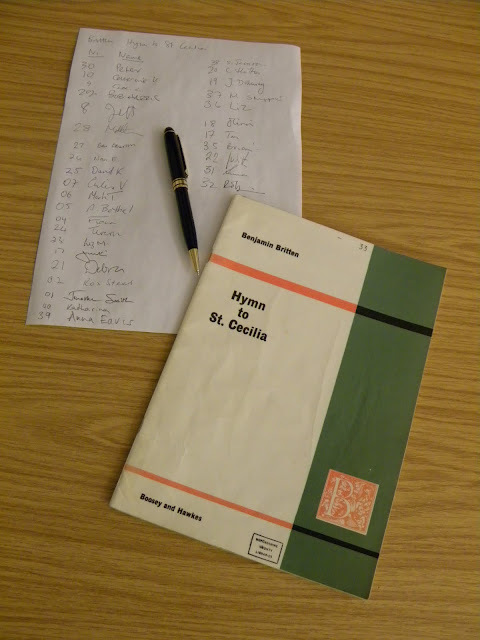 Tonight we had a committee meeting for my choir, Jubilate, at Peter's house. Photo taken at 18.04. Jo had a meeting at her old office in Oxford today, so she came in to OUP for lunch. Photo taken on the fairway at 13.55. I went to Hinksey Park this afternoon with John, Brian and Andy to play on Brian's slackwire. Predictably, I was pretty rubbish at it, but it was still fun. Taken at 15.52, this shows Brian on the wire while Andy and John play hacky sack. I also took some pretty photos of the park and along the river on my way there, and they're over on Facebook (public link). After two days of celebrating, I'm knackered, so I've stayed in today. Ventured out into the garden (at 14.26) to take today's picture. It's the 9th day of Christmas, so a Christmas tree is perfectly appropriate.